Whether you’re tinting cars or tinting flat-glass windows, there are a couple of options when choosing the way you get materials: pre cut tint or by the roll. This article will explain how pre cut film can be beneficial, when to use it and when not to. Pre cut tint is available for residential, commercial, and automotive. 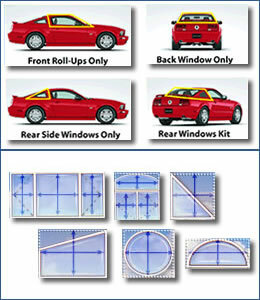 Automotive kits are cut by computer based on the window sizes of your vehicle’s make, model and year. They will be cut to the exact sizes, so there will be minimal trimming involved if any. The only other step involved it heat-shrinking the film and squeegeeing it on the window. Residential and commercial window film for flat-glass windows are available pre cut as well, but they usually come slightly over sized so that you have enough film to trim right to the edge of the glass. Many customers are unaware that this is usually how pre cut flat glass film comes, so make sure to verify with the company that you are purchasing it from. Pre cut tint is useful for two reasons: it saves and time and saves you from buying more than you need. Automotive windows are usually always oddly shaped and curved, so having them already cut for you saves a huge step in the installation process. Unless you are tinting multiple cars, pre cut automotive kits are better than by the roll and won’t be much more expensive as well. Flat glass windows are often large, which means that buying a large roll of film will mean that you have to cut these large sheets out of the roll. This can be difficult for some DIYers, so pre cut tint is an easier option. Pre cut tint is always more expensive, per square foot, than by the roll. If you are tinting say just one car, or just a few flat-glass windows, this won’t be much of an issue and the time saved will outweigh the extra cost. If you are tinting multiple cars or lots of flat-glass windows, a roll may be a cheaper option if you are primarily concerned with price. Automotive kits are priced based on the number of windows you choose to do. This can range anywhere from $25.00 – $200.00 per kit. Flat-glass tinting kits are priced by the square foot, which can range from $.75 – $3.00. You can view pricing on pre cut tint here.